The last competition of 2018 saw 36 players compete in a singles. Tanya Seckington was the starter again, and Peter Reeves was captain for the day with Alicia, Ken and Phil not there. Thanks to Peter’s daughter Catherine for selling the raffle tickets in the Clover. 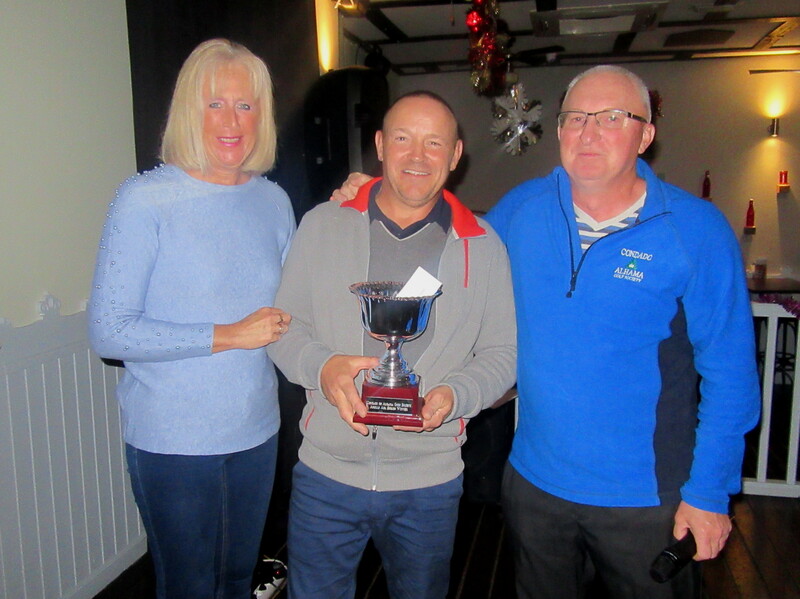 Stuart was the 2nd division winner……………. 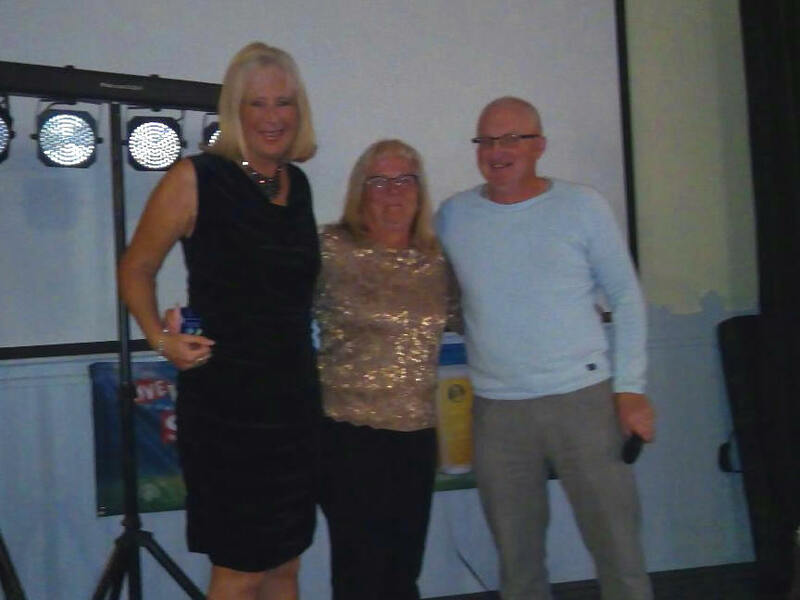 and Pat was the best of the ladies………. 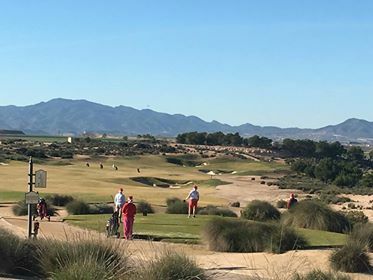 A golf management company called Ugolf will be taking over the running of Saurines, Mar Menor and also Hacienda del Alamo (all owned by SAREB) from 1st January. Ugolf are apparently a French company and look after a number of courses in Spain with a good reputation. GNK will just be running the 4 courses they own. Next week is the first Apollo Air individual stableford of 2019. Don’t forget, January 1st sees the new R & A golf rules come into effect. A perfect day, chaps fishing in the lake, not a ripple (except for the retreating duck!). A springtime image but it is only December 21st? A supposedly fun competition this week, – 36 players, with the men off the back markers and the ladies off the yellows. 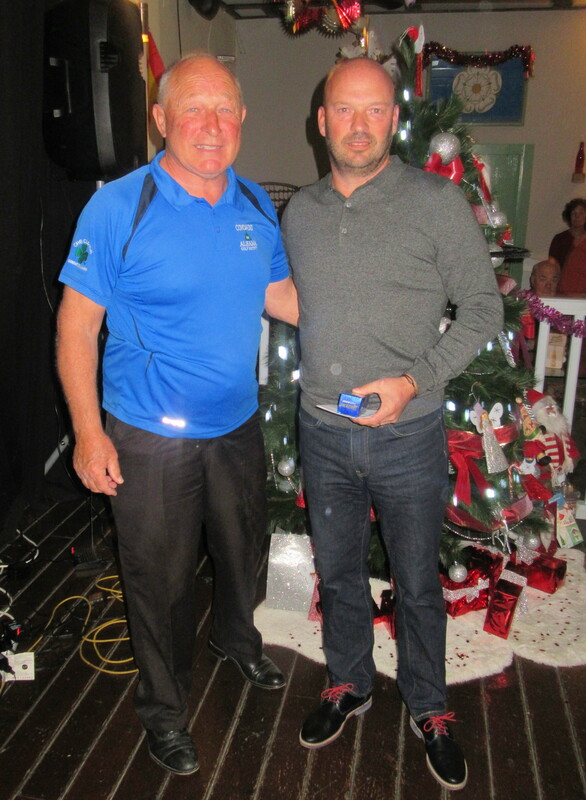 The favourite came through though with Chris McAllister winning his own Clover tournament. This meant he also won his own trophy which he had donated, he just can’t get rid of it! He also provided a super buffet after the presentation along with a karaoke and disco from Elvis. Every week Chris and Maria supply sandwiches so thanks very much for your help this year. Also thanks again to the lovely Tanya for kicking off proceedings as starter, and Buzz who added some great photos. Alicia set the players off with home made mince pies and mulled wine. Everyone was given a Santa hat which was compulsory headwear. Otherwise a donation was required to Andrea’s donkey sanctuary (sorry donkeys, everyone wore them!). 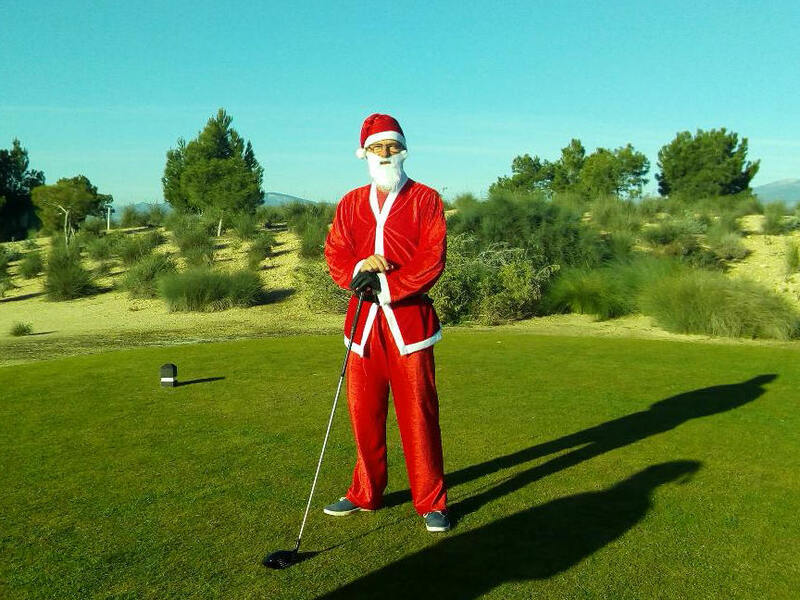 Players had a choice from 2 gifts from Santa – a free throw from trouble or a mulligan (a chance to replay a shot without penalty). Also 5 extra shots each for playing off the back tees. 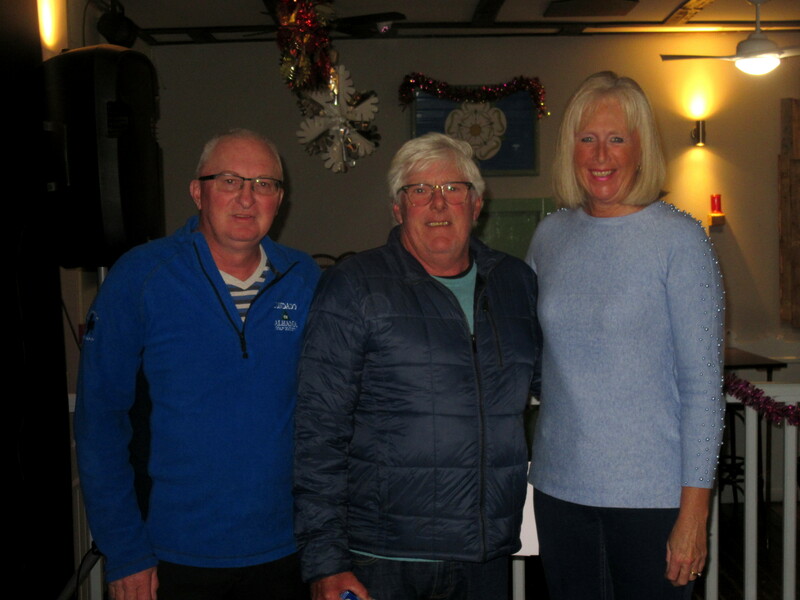 There is usually a story to tell about a golf round, and Peter Reeves was very proud to tell everyone about his 3 (birdie) on the 10th. A very difficult hole, but what Peter didn’t tell us was that his second shot finished in the greenside bunker. 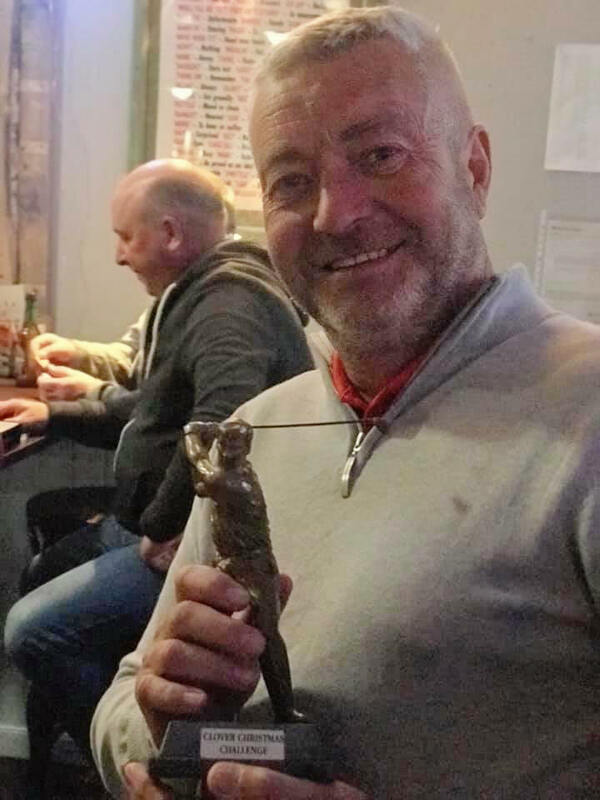 A steep face in front of him was not a deterrent – he got out his putter, rolling it up the face, over the top, a couple of bounces and hey presto! More than one way of skinning a cat. 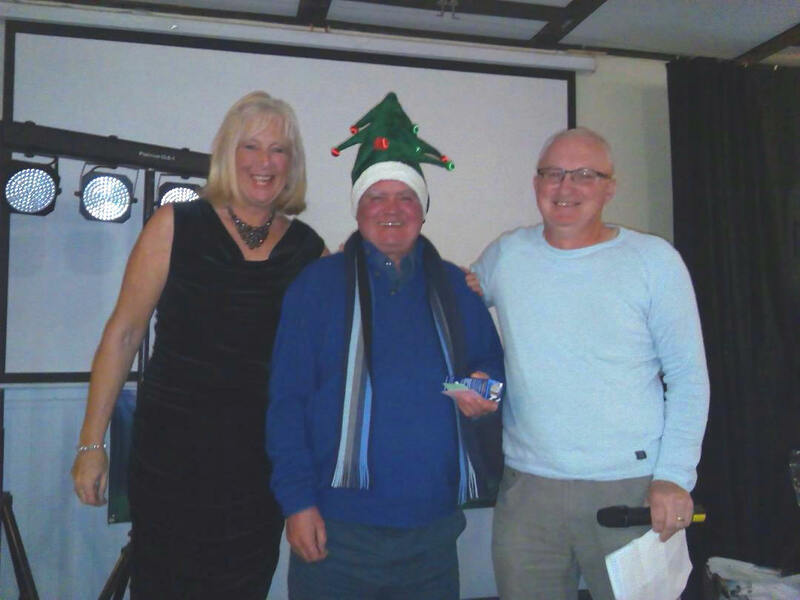 Chris wins his own trophy – again! Ian used his shots well………………………………. It’s good others have contributed photos to the blog……………thanks Tanya, Buzz and Dee! 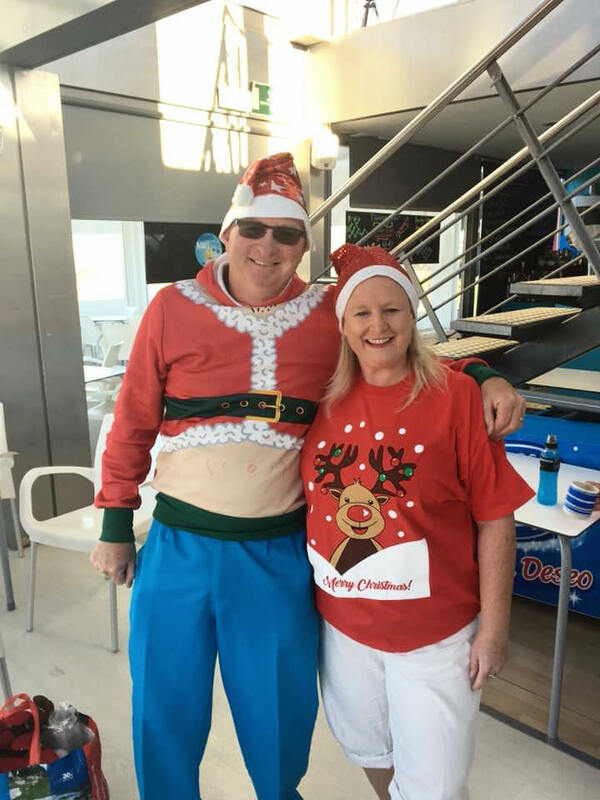 Santa (Shaun Cairney) seems to have been on a diet………………. 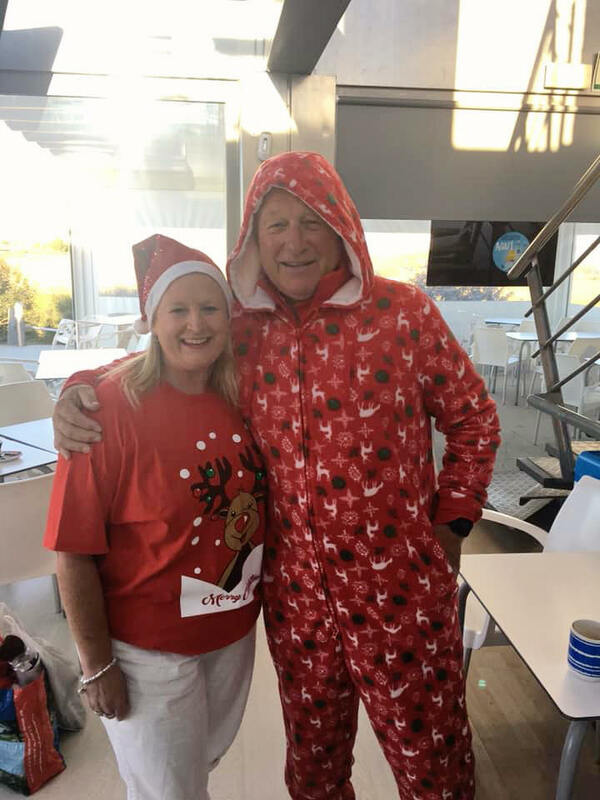 Peter Reeves ( seen here with our starter Tanya) can always be relied upon for an eye-catching outfit…………………. 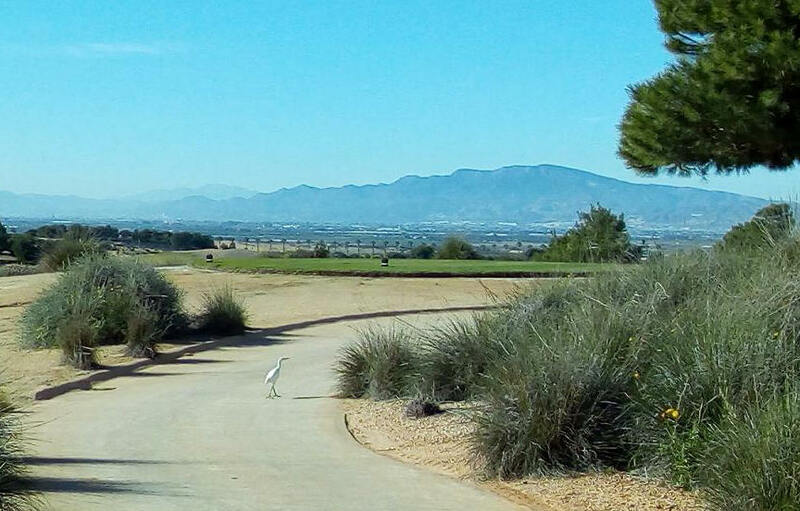 no mince pie at 10 a.m. but the mulled wine went down well!………..
this egret looked lost as it wandered around the bushes near the 12th tee……………..
where better than a golf course on a morning like this! Next week the last competition of 2018 is an individual stableford, however we have cancelled the competitions on Christmas Eve and Boxing Day. The reason is that due to lack of players we are not guaranteed to receive society rates even though we have made nearly 5000 bookings this year. All but 2 of the members booked for those days are GNK members, so can play anytime. Information on the rule changes which come in January 1st. Below is a video which makes some of the changes easier to understand. Our decision is to create the local rule for Stroke Play competitions I.e. max strokes per hole by player is 2 x Par ( example par for hole is 4 max strokes which recorded is 8 ). This rule will be piloted for all stroke play competitions during 2019. We will also remove our local rule about playing a provisional ball if the player is unsure if the ball is in a water hazard, or possibly playable from within it (covered by the new rule changes). 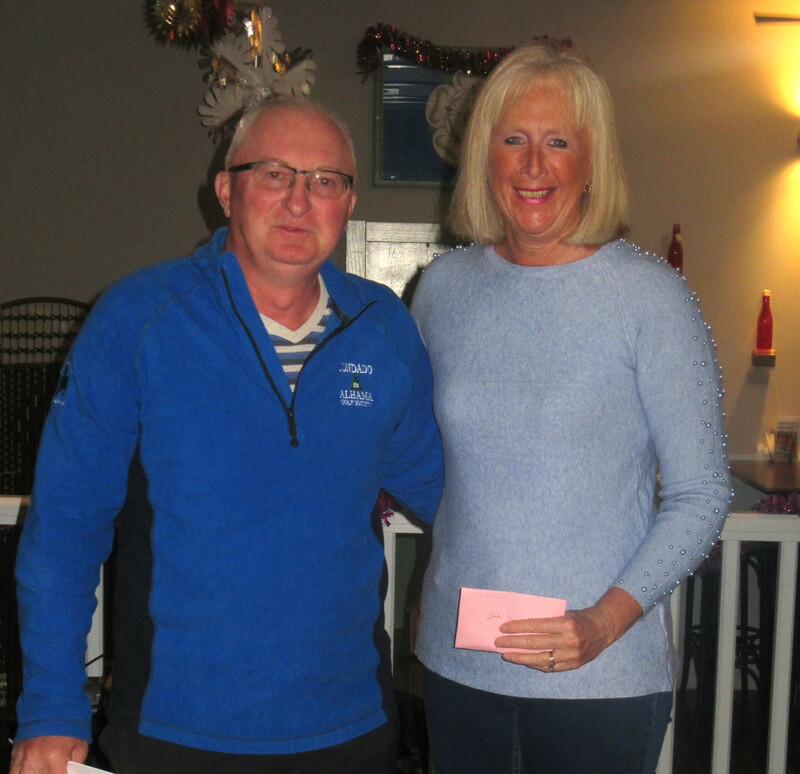 2018 has been another successful year for the Condado Golf Society, with to date 553 members renewing their membership and playing a total of 4858 rounds of golf. Following my complaint to Enrique, Director General of GNK Golf, regarding the poor condition of many of the greens during the Summer months we saw immediate action and I am pleased to report that all the greens are returning back to their former glory. The lakes have been kept topped up throughout all but the hottest couple of months during the summer and work continues on many of the bunkers, with the sand being replaced in a number of them. Indeed the bunkers on the driving range are being filled in and the sand reused on the course. The tenders for the management and maintenance of the 6 original “Polaris World Nicholas Tour” courses are being considered this month, however I have no information as yet as to which company has been successful, other than there were 4 or 5 tenders submitted. Further information on this in due course. 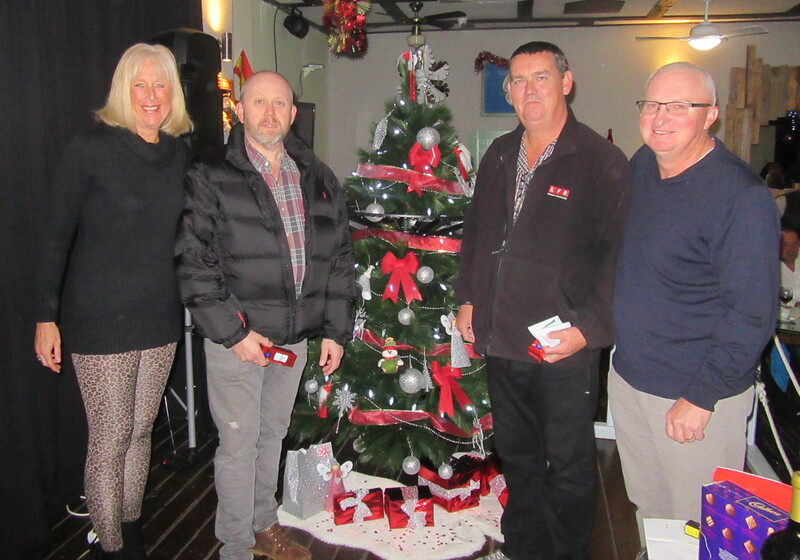 Whilst the society continues to go from strength to strength all of the organisation is falling to a few people on the committee so my Christmas wish this year is we get some more volunteers to work on the committee. Seriously though we really do need more people to help on the committee in any capacity so come help us to continue what is probably the largest, most successful golf society in the region!! Finally, from myself and on behalf of all the committee may I wish all our members, families and friends a very Merry Christmas and a healthy, prosperous New year. Looking forward to seeing everyone in 2019.
an amazing score from Neil and Mark……………. Very difficult conditions for the 36 golfers playing in pairs this week, with extremely strong winds (but so lucky we missed the heavy rain the day before). Hard against the wind but not always as easy as you think with the wind behind. I think Neil and Mark only played the holes downwind, looks like they played a different course to anyone else! Thanks again to Tanya for taking care of the starting duties. 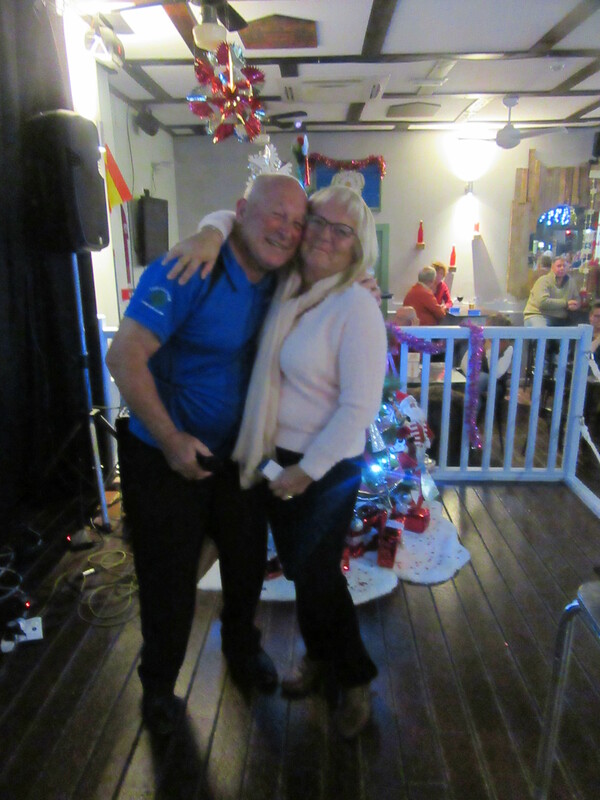 Next week is the Clover Xmas individual stableford – a bit of fun when the gents play from the whites and the ladies play from the yellows…………………. In January 2019 the new rules of golf will be implemented by the R & A and the USPGA. From January 2019 ‘Ready golf’ is the new name of the game. The aim is to speed up play. (But not all the changes are about speed). The link below covers some of the changes, too many to list here, so familiarize yourself with what is different – there are some radical changes! The new rules are also shown in our link to them on this blog – go down to ‘Pages‘ at the bottom right and the videos explain the main changes, instead of trawling through 200 pages in a book! However, keep up to date with our local rules which may vary from the R & A rules – they can be found also in ‘Pages’. Late information – just received some very sad news. Dave Griffiths, one of our members, (on-site painter) has collapsed and passed away in the last few hours. His son Wayne is also a society member. We pass on our deepest sympathy to his wife Chris, sons Wayne and Kirk all the other members of his family. God bless, rest in peace Dave. 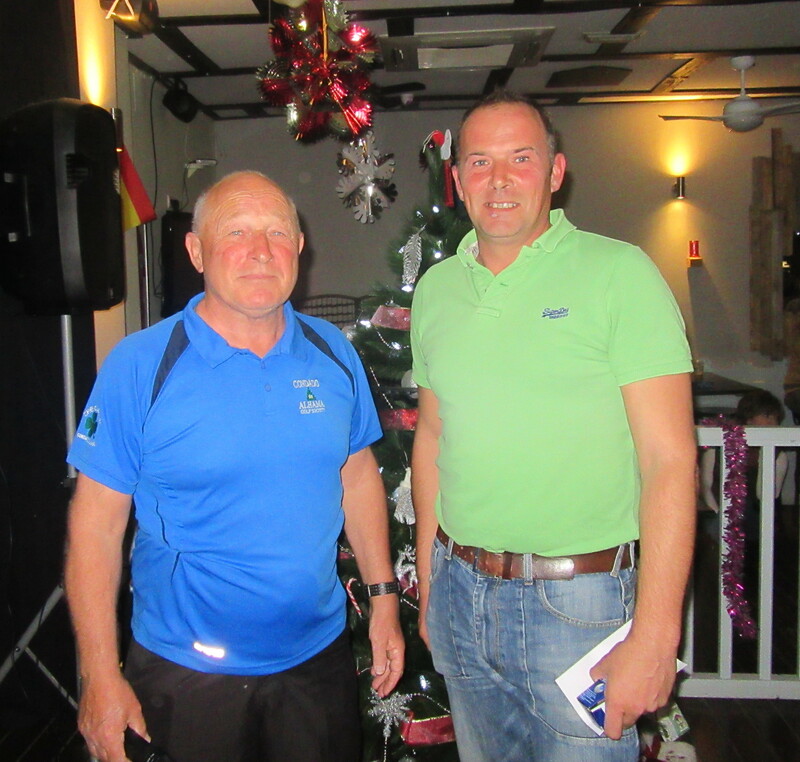 Well done Tony, low handicap and very consistent over the year! Sorry for the late posting, but had no internet connection until 4.30 Sunday. A lovely spell of good weather over the last few weeks continued for the 40 golfers in the last qualifier for the annual championship. A bit like the formula one system where each race is very prestigious, but the overall championship is the target. 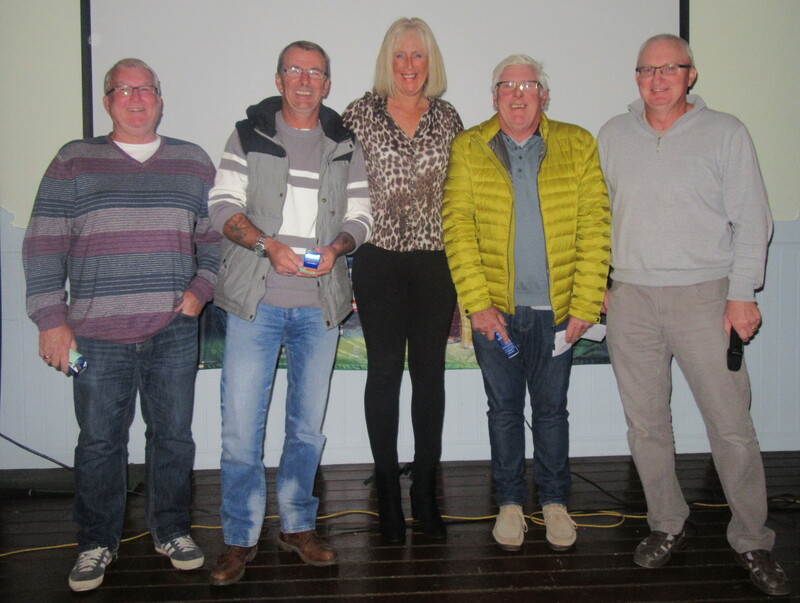 Only one or two were still in the frame for the main prize, but everyone had a chance in the December stableford. 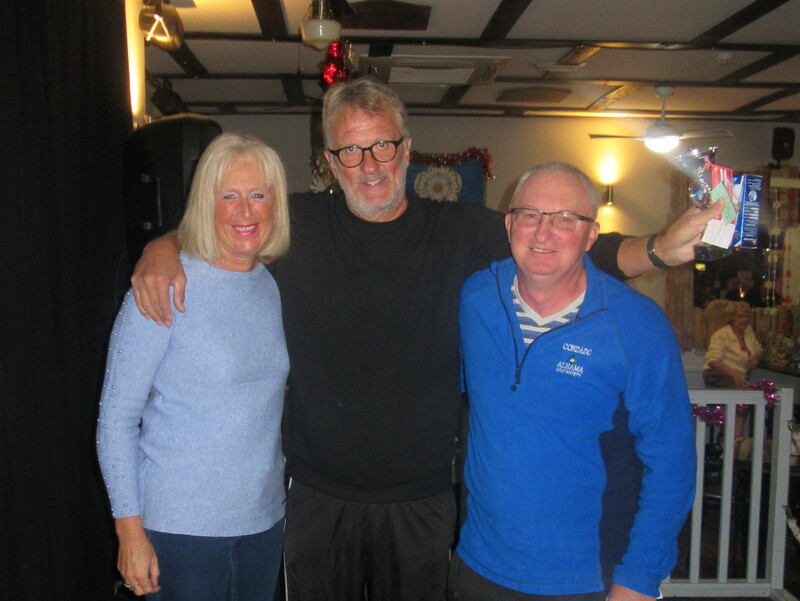 But in the end, Tony Andrews didn’t have to post a score as the challengers failed to deliver – Tony is the annual champion! Well done to Gabbi Buch who had a great scorer to win on the day, and also thanks to our ever-reliable Tanya Seckington for being our starter! No ladies prize today, only 3 entries. Gabbi must have played like Nicklaus for 45 points! 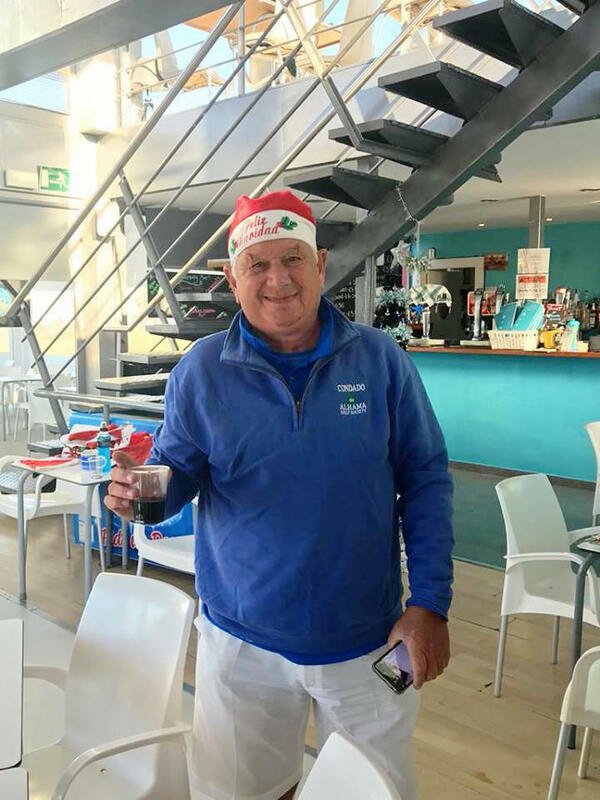 Well done Roy, 1st division winner…………..
Three away days are planned for 2019 – at Lorca, Desert Springs and Aguilon. The first is at Lorca on Monday January 21st, first tee time 11 a.m.. The price is 40€ to include the green fee, buggy, 2€ sweep, bacon bap and coffee on arrival and coach transfer. The bus will leave Al Kasar at 9 a.m. Also included is a packed lunch. A deposit of 20€ will confirm your place or if you are not on site a definite commitment by email with the date of your arrival (when the deposit must be paid). The trip is for the first 40 golfers, plus approximately 15 wives/partners who will go to the Lorca shopping centre. 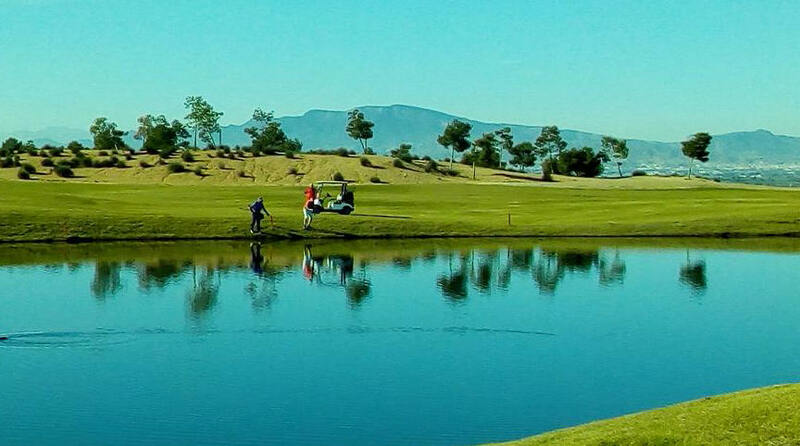 The next is Monday June 3rd at Desert Springs (11 a.m. first tee off). The price is 50€ to include green fee, buggy, range balls, packed lunch and coach travel, leaving Al Kasar at 08. 30 a.m. Breakfast, burger & chips or buffet may be possible but is not included. Again, 20€ deposit is required from the first 40 players (same rules as before) and 15 wives/partners who will go to Mojacar for the day. The last venue is Aguilon on October 7th (maximum 40 golfers, first tee from 11.18 a.m). Price 45€ with deposit required as above. Included is the green fee, buggy, packed lunch and coach return. Departing Al Kasar at 09.30 a.m. again 15 wives/partners going to Aguilas town. 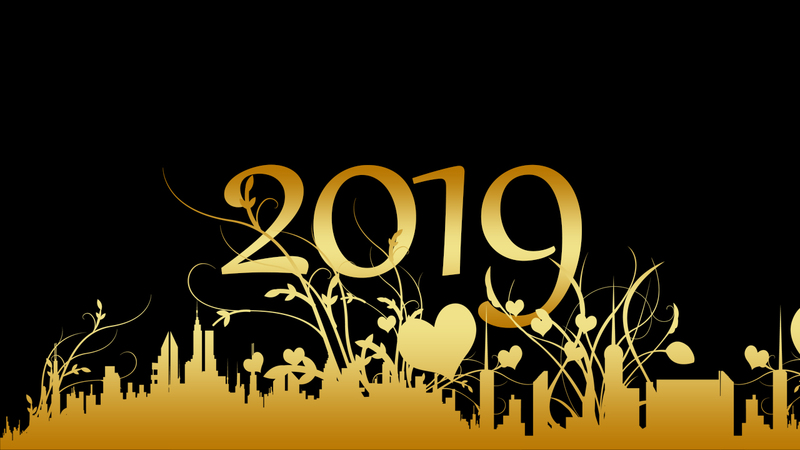 The new rules brought in by The Royal & Ancient will be active from January !st 2019, so if anyone is able to bring over a few of the new rule books the committee will be most grateful. Next week I will post a summary of the main changes – I will copy John Brown’s post from the Camposol Gazette which seems to cover the main points. Hope you don’t mind John, your comments will be so useful. 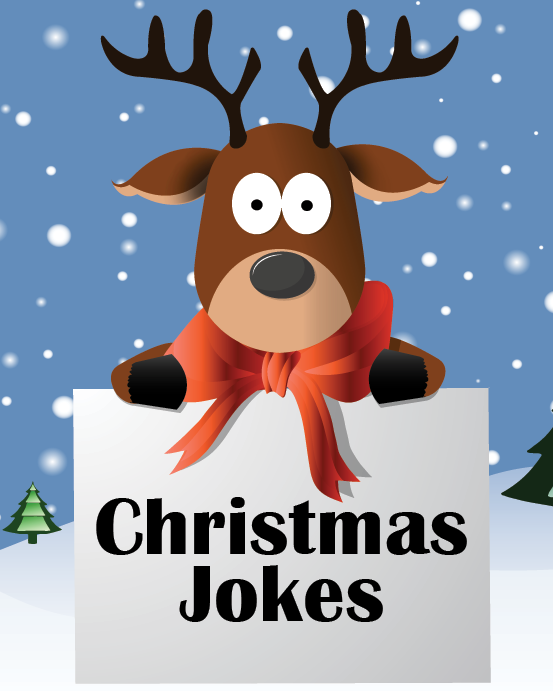 A joke to finish with…………………………………..
Paddy was on his deathbed and knew the end was near. His nurse , his wife, his daughter and two sons are with him at his home in Belfast. He asks for 2 independent witnesses to be present and a camcorder be in place to record his last wishes. When all is ready he begins to speak. ‘My son, Seamus, I want you to take the houses in Cultra. My daughter, Geraldine, you take the apartments over in Malone Road. My son Patrick junior – I want you to take the offices in the city centre. Bridget, my dear wife, please take all the residential properties on the upper Lisburn Road’. Lots of sunshine, but golfers were wrapped up well against the stiff breeze. 36 players made up 9 teams of 4, with 3 scores to count at each hole. Friday was back to the start of winter golf with the first group out being 10.00 (not 09.00). The reason for this is to avoid delays when the course is hit by early morning frost (not due just yet!). Thanks to Fiona Keating for acting as starter this week. Next week if the final Apollo Air individual stableford of 2018 and the annual champion will be crowned! 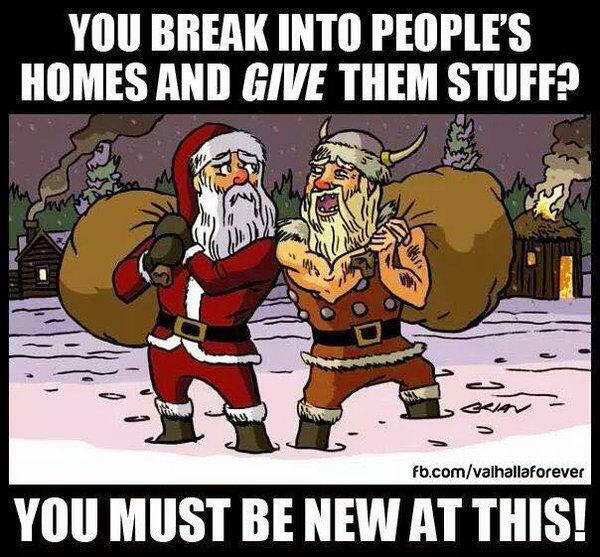 Christmas is nearly here but do we have some cultural differences between nations?